Ms. Day is a U.S. History teacher at Milwee Middle. 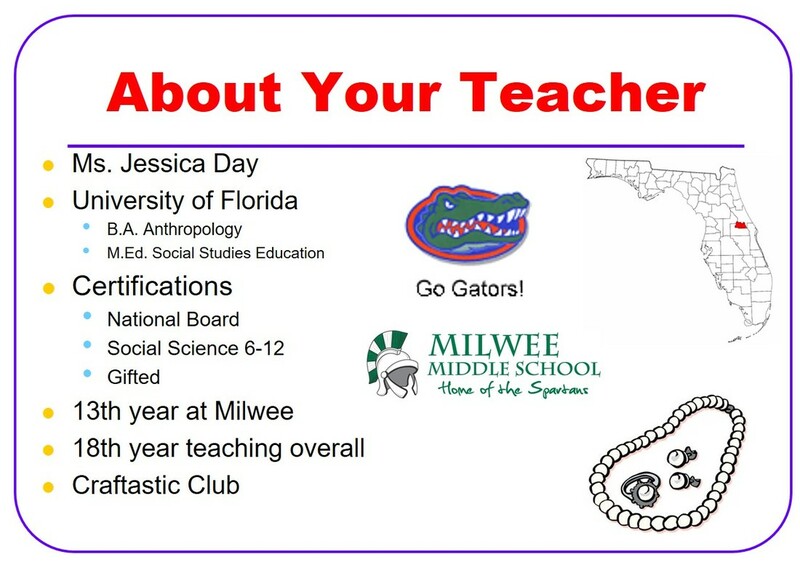 She loves the Florida Gators, social studies, Hamilton, Disney, kitties, and, most of all, students who do their work. Eighth Grade Pre-IB Prep United States History is designed for highly motivated students who wish to pursue the International Baccalaureate Program or Advanced Placement courses in high school. Students will explore the events of U.S. history using documents, images, cartoons and other primary sources along with secondary text. With a more rigorous focus on document based inquiry, the students will examine and analyze the political, economic, technological and social developments of the United States from the period of colonial settlement through post-Civil War Reconstruction. Florida’s role in our nation’s history will also be emphasized. Instruction will focus on students developing an understanding of themes in U.S. history including the impact of expansion, the development of conflicts, the influence of diverse groups on American culture and the impact of world events on American thinking. This course was designed to give students a more in-depth view of U.S. History and includes the development of complex skills in reading, writing and research. Writing in a historical context will be emphasized and students will be expected to engage in extended research and produce writing of significance on a frequent basis. At Milwee Middle, engineering lessons will also be infused throughout the year. The main textbook for this course is History Alive! The United States Through Industrialism. Students will have online access to the textbook at home and a hardcopy textbook in class. ****Change of plans: Students checked out a hardcopy of the History Alive! textbook on August 28/29, 2018. It goes home and stays at home until the end of the school year. Community ServiceStudents in the SCPS Pre-IB program are required to participate in community service. Eighth grade students must earn 24 hours of community service between the end of 7th grade & mid-May 2019. If you would like to qualify for the Presidential Service Award for 50 hours or more of service, you MUST submit your hours by April 1st. Also, if you do community service hours at any SCPS school, please sign up to become a SCPS Dividend and log those hours.